I have decided today, on the tenth anniversary of the Quillayute River disaster, as a small tribute to the crew of the 44363 and to all the other lifeboat men and women, to dedicate this site to them. 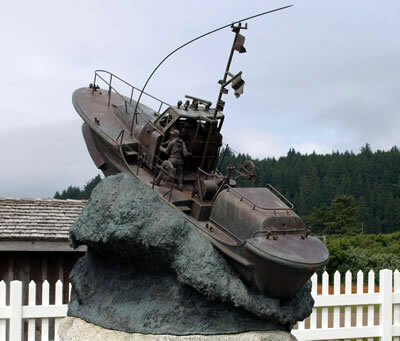 In the early morning ten years ago, the U.S. Coast Guard 44ft Motor Lifeboat the 44363 set out from Station Quillayute River in atrocious conditions with a crew of four Coastguardsmen. They were going to the aid of a small sailing boat the “Gale Runner” with a crew of two, which was dismasted and in danger of sinking. Soon after crossing the treacherous bar, tragedy struck! The lifeboat was hit by enormous seas capsizing her three times. During this time Boatswain's Mate Second Class David A. Bosley, Machinery Technician Matthew Schlimme, and Seaman Clinton Miniken were swept away and drowned. Leaving Seaman Apprentice Benjamin Wingo, the only survivor aboard the severely damaged lifeboat. The two people from the “Gale Runner” were later hoist to safety by a U.S. Coast Guard helicopter. I hope that when you are looking through the pages here, perhaps when you are looking at one of the dramatic photos, or maybe reading one of the reports from a medal service, you will spare a thought for the men and women who man these boats and risk their lives every day of the year to save others. Unfortunately the previous guestbook was closed when the service supply stopped offering the service, so we lost all the great comments. So please feel free to write again. This site is dedicated to the remarkable 44' Motor Lifeboats, a boat in which her crew always had the confidence that she would bring them safely back to port. The 44' MLB was designed by the U.S. Coast Guard, with work starting on the prototype (USCG 44300) in April 1961, which was completed on the 9 March 1962. A total of 110, 44' MLB's were built for the U.S. Coast Guard, with the last boat (USCG 44409) being completed in 1972. The last 44' MLB to serve with the US Coast Guard was the 44301, which was retired from service on the 8th May 2009 at Station Chatham in Massachusetts. The 44301 was kept on at Chatham due to the special bar conditions there. She was finally replaced by three 42ft Special Purpose Near Shore Lifeboats built especially to handle the these unique conditions. There was a great interest shown in the 44' MLB at the Ninth International Lifeboat Conference in Scotland in 1963, which eventually resulted in several countries adopting the design with some modifications for their own lifesaving organisations. The RNLI in Britain acquired the USCG 44328 in 1964 and built a further 21, naming the class "Waveney" after the river in which the first boats were built. The Canadian Coast Guard received the USCG 44353 in 1966 and built a further 17. The Italian Coast Guard purchased the USCG 44337 and USCG 44338 while the Norwegian Society for Sea Rescue and the Portuguese Institute for Lifesaving both built two boats. A further ten boats were built under licence in England for Iranian Coast Guard, bringing the total in all to 162. As a measure of the success of the design of these boats, over half of the decommissioned US Coast Guard 44 MLB's were transferred to foreign maritime services, under the Foreign Military Sales (FMS) program. It was a similar story in Britain where again more than half of the retired RNLI's Waveney's started a new era of lifesaving in Australia, New Zealand, Uruguay, Namibia and Canada (CG Auxiliary). All but one of these boats, are now with commercial businesses or in private hands. If you have not been lucky enough to have experienced this boat or doubt the qualities of it, why not follow the link below to my guest book and see what some of the crewmembers have to say. As far as I know, this is the only site on the Internet which is dedicated purely to the 44ft Lifeboat!!! If you are a member on the Coast Guard Channel Community, please feel free to join my groups there. By BMC Gary Hudson Ret. By BMC Mike Williams Ret. Who's Linked To This Site ? You will be credited for your photos etc., plus you will have the knowledge that they will be gratefully received and will be enjoyed by many. Portuguese Institute for Lifesaving - ? At Maryland (artificial reef) Renamed "O.C. M.S.S.A. Wreck" or "Harrison Group Wreck"